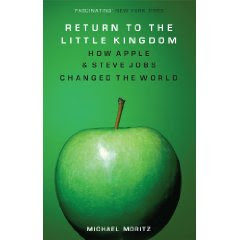 I finally finished yesterday "Return to the little Kingdom" by Michael Moritz. A Story about how Apple was founded and turned into a big company -though the story ends many years before the Apple we know today was created (the writer covers the most recent events in the brand new 2009 epilogue). Anyway, I have not loved it. It is just ok. What I have loved the most is to feel the thrill of founding a company and make it grow, though it is obviously not an easy task. I am posting below the review I have written on Amazon. I always use Amazon to see some reviews before I purchase something, so I find it fair to do the same for others. Next on my shelf is "Too big to fail" on how Wall Street cracked a year and a half ago. Can't find the amazon review link.